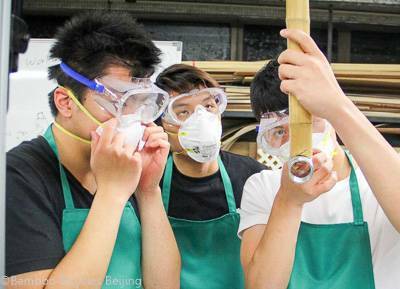 Choose from weekly workshops at our Beijing location, your school, or your company! 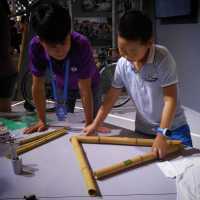 Make a bamboo bicycle as a team-building and design challenge exercise at your work! 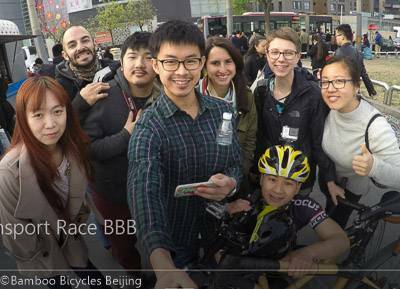 BBB works with you to design a hands-on, brain-waking, collaborative experience that also leaves you and your colleagues with bamboo bikes! Contact us! 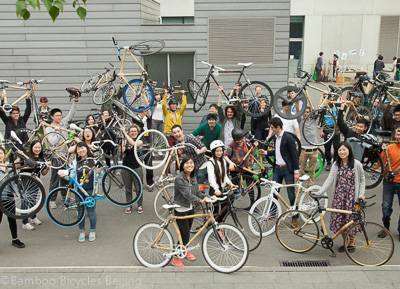 The original BBB workshop has built over 500 bamboo bikes with makers like you! 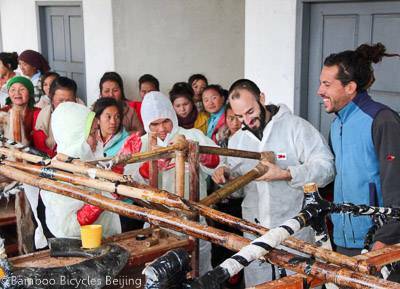 We teach people to build their own bamboo bicycles from scratch over the course of a weekend. Sign up today! We love working with students! 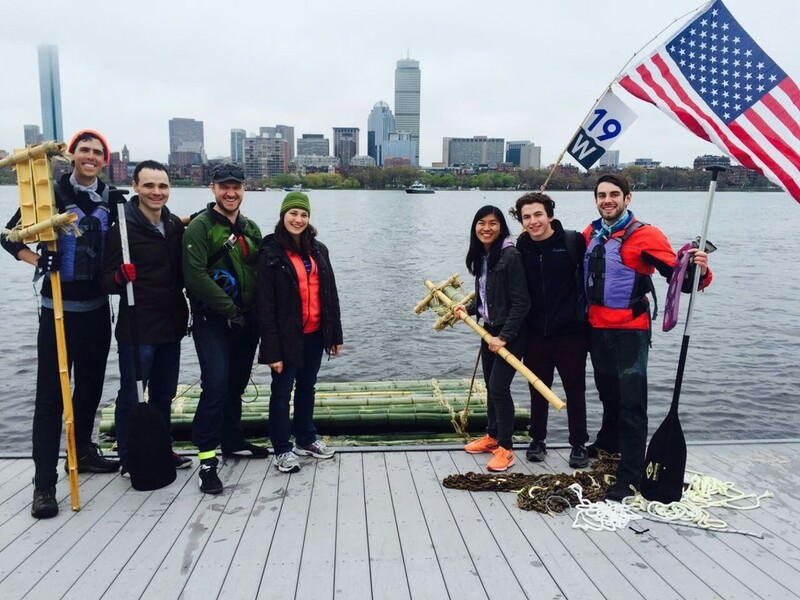 Want your students to learn about design-thinking, sustainability, and the maker-ethos? Get in touch with us to see our past curriculums! 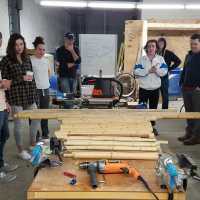 At BBB, we work with and build a community of people who love making. Working with youth, elderly, locals, foreigners, women, men, and businesses big and small, we are proud to run a variety of projects that help empower people to be leaders in the community. 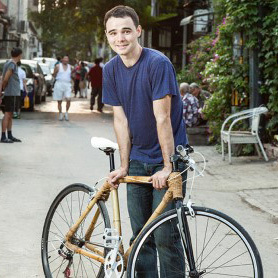 Over 400 community members have built their own personalized, custom bamboo bike! Every summer young BBB fellows inititate their own community projects! Join us for 2017! BBB Community leaders race bamboo bicycle vs taxi vs bus vs subway during the morning commute. 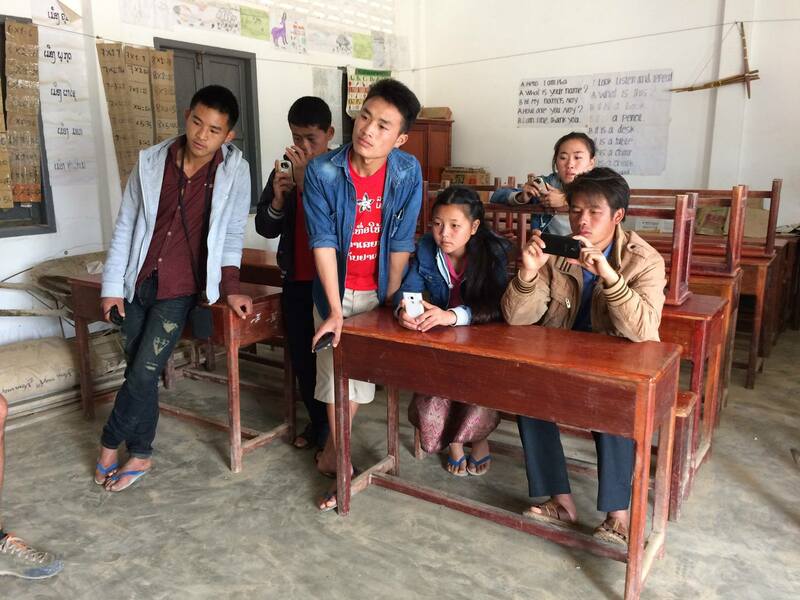 Workshops and events in schools, communities, and organizations from Shanghai to MIT to rural Laos! 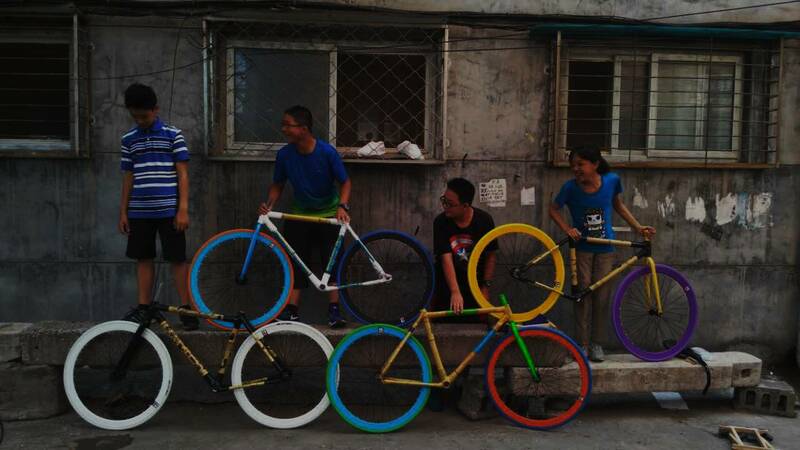 Our bikes and builds only get better and cooler with bright ideas from the community! BBB community members make a lot of media to share! Check it out! 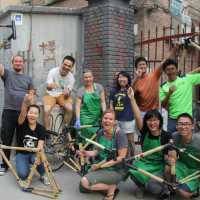 Bamboo Bicycles Beijing started in 2013 as a fun social project. 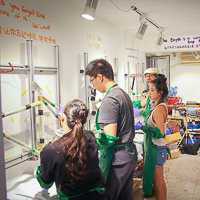 It has since organically developed into a community-drive social enterprise that strives to empower local community to take ownership over their mobility and environment through shared tangible action and creation in our workshop spaces. 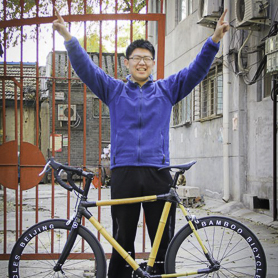 In 2013, David Wang began fixing up thrown out bikes in Beijing in his spare time. One frame he picked up was too rusted, so he hacked it apart and remade it with bamboo. 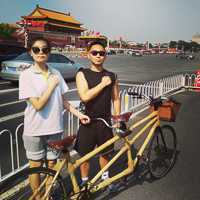 He rode that bike with Candy in Taiwan were they researched bamboo. 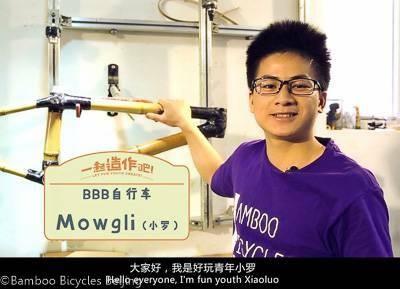 After returning from Taiwan and building several more bikes, the idea for a project called "Bamboo Bicycles Beijing"" was formed with Candy, Go, Xiao Yezi, Xiaobai, and Antonia! 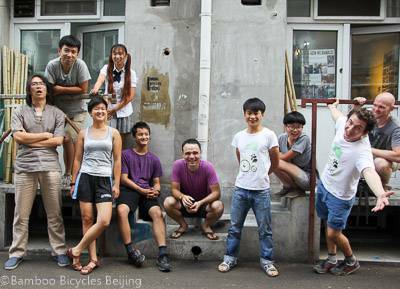 A Kickstarter and Dreamore (追梦网) were succesful and the group rented out a tiny ex-mahjong workshop in Beijing's traditional hutong. 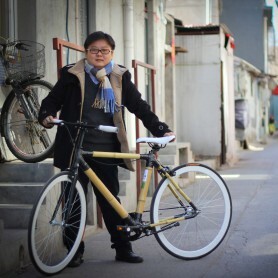 The goal was to make 25 bamboo bikes! WATCH THE BEGINNING HERE! The 25 bikes were finished in no time. 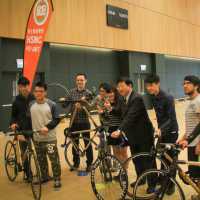 And by the winter, new community leaders had joined to to lead workshops, assemble bikes, and run some workshops in Guangzhou and Hong Kong. 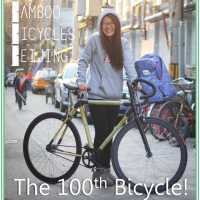 The 100th Bike is Built! 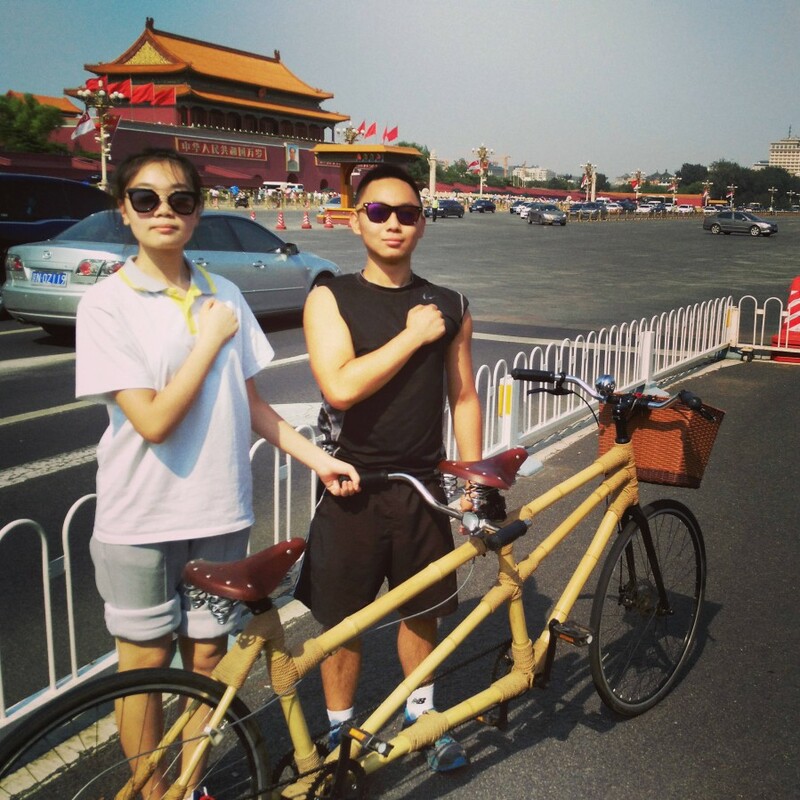 We'll always hold BBB's Yanhui's bike in our hearts because it was the 100th bike! Using money saved from commercial projects, BBB recruits 5 stellar BBB Fellows from high school and college. 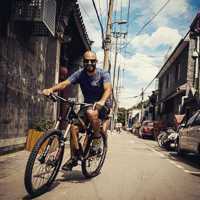 They build their own bikes and then initiate some great community projects ranging from: map making, bamboo crafts workshops, documentary films, an illustrated guidebook, and bike refurbishment. South African native, Claudio Rebuzzi, leaves his English teaching job to take over BBB's operations. He brings on the fan-favorite, Mowgli, as the in-house mechanic, translator, and nap-taker. 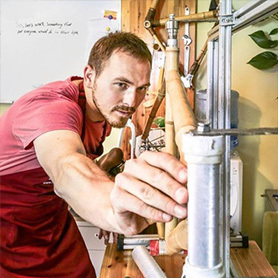 Claudio and Mowgli build all kinds of new bikes while increasing BBB's big projects with clients from Mercedes, Otis Elevators, ChildFund, USAID, and more. 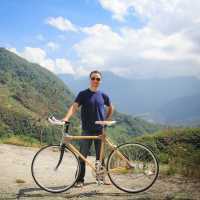 Facing snow, mountains, and a totally different work environment, BBB teaches youth in rural Laos to make bamboo bicylcles using local bamboo. 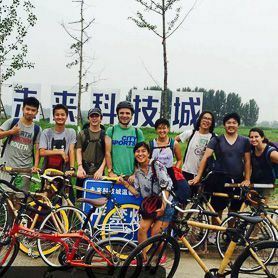 Students and community leaders have held workshops around the world: Hong Kong, Shanghai, Fujian, Sanya, Guangzhou, Addis Ababa (Ethiopia), Denver (USA), Boston (USA). (Actually these didn't happen at one time, but over the whole year). Long-time part-time assitant, Dangao, joins full time! 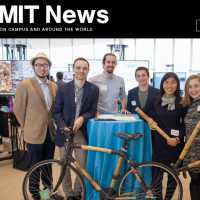 BBB's 2nd Annual Summer Fellowship gets funding from MIT Global Ideas! 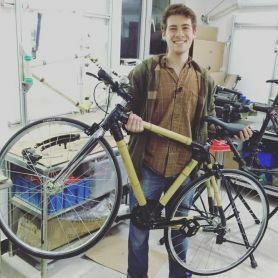 With funding from MIT Global Ideas, Stanford, and Hampshire college, BBB hosts another cohort of amazing Summer Fellows who end up starting BBB's volunteer program, making a bamboo bike rack, interviewing BBB's neighbors, making a bamboo strength test machine, and more! Claudio leaves BBB for Wales, and Mowgli and Dangao take over. 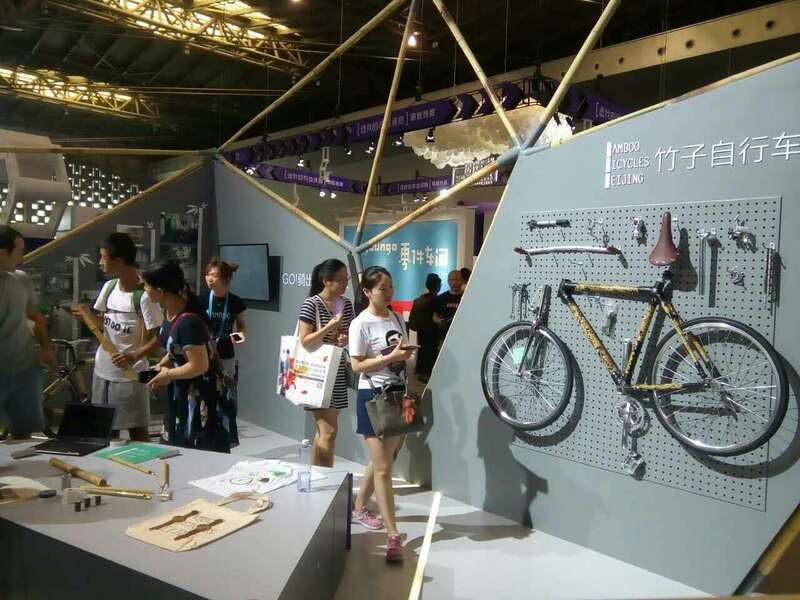 They pioneer partnerships with local schools to teach more students to make bikes. Long in the making, Mark partners with BBB begins teaching workshops more regularly with spaces in Shanghai. Meanwhile in Boston David and Max hold the occasional workshop at MIT and Brookline Teen Center. We're always looking for new friends, ideas, and opportunities! Get in touch! BBB's community is its team! There are scores of people on that team, and the people below are some of the more frequent and current leaders in the workshop(s). Swing by the workshops! Send us an email or WeChat message! Introductions to all our fellows! For now, feel free to read last year's introduction to the project. 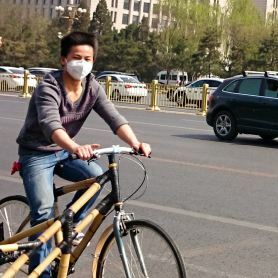 What's the fastest way to get to work in the morning in Beijing? Take your guess and watch the race! 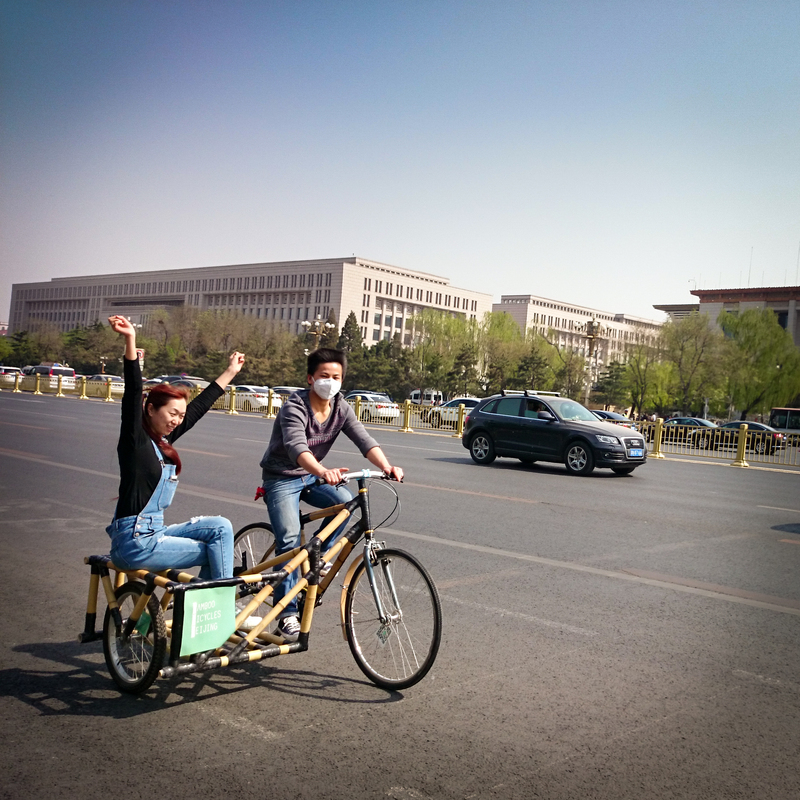 And our students have taken their bikes to countries all over the world! 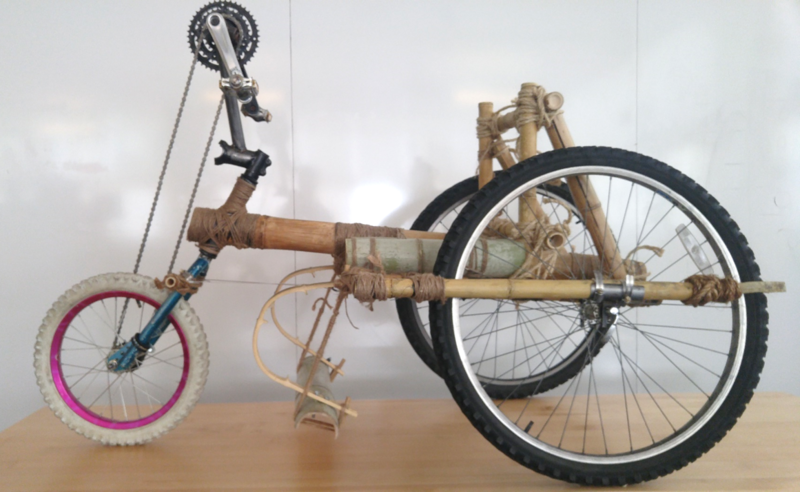 Geena, one of BBB's original Fellows, kicks us off with her illustrated "Making Your Own Bamboo Bicycle"" guide. She learned to use Adobe Illustrator on her own! While other "micro-innovations" have made some changes to this guide, it is still one of the best things our community leaders have created! Middle school students have made some great looking bamboo illumination! 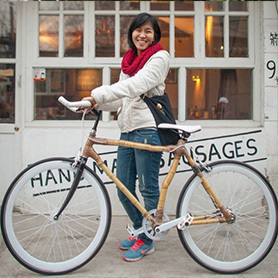 BBB Fellow, Karen, made a much needed bamboo bike rack and even tried her hand at giving it an auto-lighting system. We make a lot of media, and a lot of people make media about BBB.